Free fall stunt jump is amongst the newest sporting activity that has caught the attention of various people in the globe. It is indeed enjoyable and does not only offer excitement amongst the players but is also coupled with a range of benefits some of which include building confidence amongst the players and as well as a form of excise. 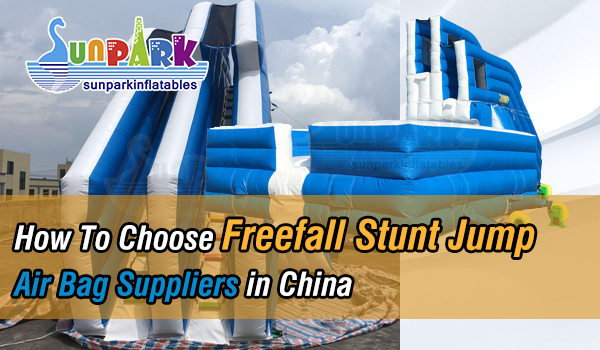 Sunpark is a widely known producer and supplier of the Free fall Stunt Jump Air Bags in China and it would be a wise idea to partner with them to acquire these high quality bags. The bags are designed in such a way that they can hold any kind of an event ranging from picnics, carnivals to even multiple events without any restrictions of a particular group. This means that each and every person willing to engage in the event is allowed not unless they are too old or weak to play. If you are wondering how to choose the freefall stunt jump airbags, you need not to worry anymore as this guide is prepared to help get all the relevant details you need to acquire the best airbags. •Material used- the airbags are completely water resistant, fully protected from the UV effects and also slow to fire damage and hence giving time to put off the fire. •Warranty- the Sunpark offers a 2 year warranty for this inflatable air bags and you can be sure of getting your issues sorted during this period in case of any complaints on the airbag. •Package- the airbag is packed along with a repair kit, a long-lasting PVC bag, and a bag for packaging purposes which is freely charged and also a carton box. •Color- the airbags are usually white and blue in color but any customer who has a different color combination then the airbags can as well be customized. As mentioned earlier on, these airbags can be used for any kind of events and therefore no worries of where to set up the airbag. It is mobile and hence can be used anywhere at any particular time. It also preferred as it can support a large group of players regardless of their age differences. It also requires a maximum of 1 hour to set up before you can begin your operations. Sunpark’s products are highly durable and the company gives a warrant of 2 years in case of any complaints amongst the various customers. The airbags are waterproof and also protected from UV rays hence making them last longer. Even if you are playing for the first time, there is nothing to be afraid of as the inflatable air bag is very safe to use. It is soft and you cannot at any time fall on a hard object or ground as you play. The stunt jump does not require any safety harness as the players need only to climb to the jumping tower and jump off to the soft and cozy air bag. This means that a larger group of individuals can engage in the game at the same time. There are also different landing platforms which ensures that all players have perfect landing techniques as they move to the next platform. Your destination is not a limitation to getting a supply of these air bags and it is therefore very easy to receive the products since you only need to make an order of the products you need and make the required payments as the company makes the shipment for you. No complicated procedures required to get the products and any customer can always contact the company’s staff in case of any complaints. Sunpark is specialized in providing a range of these quality China inflatables and you can always make your order anytime you make up your mind to keep enjoying the benefits. The various air bags are charged differently to cater for every customer and it is thus very possible to get the best airbag that suits our needs and as well conforms to your needs. You can also visit the company’s website page for more details about the product, http://www.sunparkgz.com/products/inflatable-freefall-stunt-jump/.